TCM's October Star of the Month is the debonair David Niven. 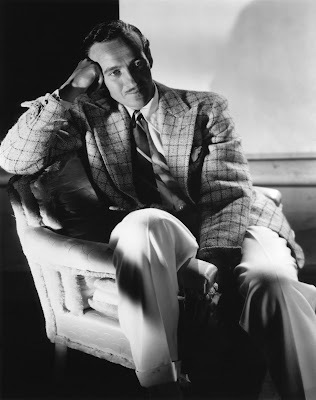 TCM is celebrating the career of David Niven with 39 movies airing each Monday in October. Here's what you need to know about this dashing star. FYI: TCM sometimes changes the air times and /or movies, so you can go to www.tcm.com to check the updated schedule. Born: March 1, 1910, in London. Died: July 29, 1983, in Chateau d'Oex, Switzerland. Nivien is buried in the Chateau d'Oex cemetery. Academy Awards: Niven won a Best Actor Oscar for Separate Tables (1958). Brief bio: Niven was born to an upper-class family with strong ties to the British military. Niven's father, William, was killed in action in World War I during the Gallipoli campaign. Niven followed his father into the military, but his free-spirited nature and love of pranks didn't make him a good fit for the army (Once during a long boring lecture from a major general, Niven asked. 'Do you know the time, sir? I've got a train to catch.') Niven appeared in a few British films, but he didn't have much success until he moved to Hollywood. He worked his way up from an extra, and he gained attention with prime supporting roles in movies like The Prisoner of Zenda (1937) and The Dawn Patrol (1938). Niven's big breakthrough came in 1939 when he had memorable roles in Wuthering Heights, Bachelor Mother and Raffles. Despite his burgeoning career, Niven volunteered for the army during World War II, serving in an intelligence unit during the invasion of Normandy. Niven resumed his acting career in 1946. He quickly became a sought-after leading man, appearing in hits like A Matter of Life and Death (1946) and The Bishop's Wife (1947). Niven also became a successful writer, publishing two novels and two memoirs. Niven continued to be active until he was diagnosed with ALS or Lou Gehrig's disease in 1980. He passed away in 1983. Clark Gable, Cary Grant, Bob Hope, and David Niven rehearse for the Academy Awards. Fun Fact: One of Niven's favorite anecdotes about World War II goes like this: Niven approached an American sentry during the Battle of the Bulge. The sentry demanded the passcode, "Who won the World Series in 1943?" Niven replied, "I haven't the foggiest idea, but I did co-star with Ginger Rogers in Bachelor Mother." My picks are a romantic comedy, a masterpiece, and a remake. 1. Bachelor Mother airing at 9:30 p.m. Oct. 5: In my opinion, Bachelor Mother is the best romantic comedy made in old Hollywood. It tells the story of a department store clerk (Ginger Rogers) who, through a series of mishaps, adopts a baby. Rogers is great, but this film really belongs to Niven, who is hilarious as the tightly wound son of the department store owner. 2. A Matter of Life and Death airing at 8 p.m. Oct. 12: Niven returned to the screen after his service in World War II with this Technicolor masterpiece from directors Michael Powell and Emeric Pressburger about a pilot who want the chance to continue his life. 3. My Man Godfrey (1957) airing at 11:15 p.m. Oct. 19: The 1957 version of My Man Godfrey is nowhere near as good as the 1936 original, but I still enjoy Niven in the William Powell role of a derelict who becomes the butler to a rich family. A great movie not featured this October: Niven appears as James Bond in the original Casino Royale (1967). He was Bond author Ian Fleming's first choice for the role, but producers thought he was too old and cast Sean Connery instead. Casino Royale is a comedy about an aging Bond who is forced out of retirement. Old Hollywood video: The famous moment at the 1974 Academy Awards where Niven outwitted a streaker. 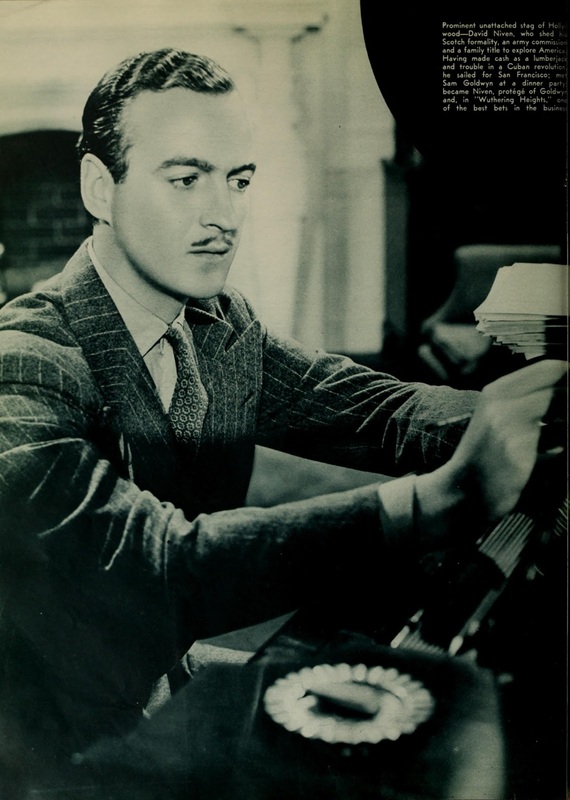 Fan Magazine Flashback: A 1939 portrait of David Niven in Photoplay. Old Hollywood GIF: Niven gives the thumbs up in A Matter of Life and Death. via Giphy. 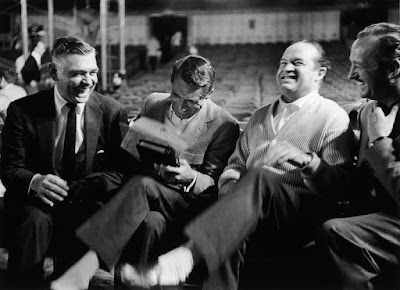 Old Hollywood Archives: Rogers and Niven raise an abandoned baby in Bachelor Mother. There'll be more on Niven on social media. Follow me on Tumblr, Google+ or Pinterest or like us on Facebook. Follow us on Twitter @oldhollywood21. I'm glad you picked the My Man Godfrey remake, that means I'm not the only one who enjoys it. It seems to live in the considerable shadow of its predecessor, and understandably so, but it's a cute, fun movie. Can't wait to see it again tonight.